It slipped out of me when talking to a friend on the Fourth of July weekend when she mentioned that she was going to the parade the next day. “I hate parades!” I said. Then the memory bubbled up. Every year my family attended the parade. Every year there were two things I wanted that so many other children seemed to get: a helium balloon and a soft pretzel. 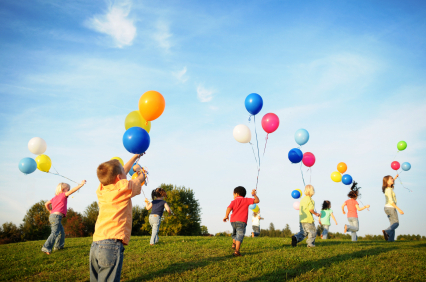 As a very young child, I thought brightly colored helium balloons were almost magical. I wanted one so badly. One time perhaps wouldn’t have made a difference. But always it was the same, year after year. I never did get a helium balloon that I can remember, not even on my birthday. I suppose at some point I quit asking, so perhaps my parents never knew how much I wanted one. Like the “Popsicle memory” mentioned in The Healing Code, such a memory seems trivial, almost embarrassing to recount. I’m sure had I not read that book, I never would have understood that such memories plant destructive seeds based on lies that grow and choke out out the good fruit of life. This particular lie grew into beliefs that “I can’t get what I want,” “I don’t deserve nice things,” “It’s wrong to ask for what I want,” “Life is all about the practical,” “I can’t have anything special or too expensive” and probably others. When unhealthy beliefs are formed at a very young age, especially before age 6 when the brain develops more maturity, they become “hard-wired” into our core belief system and go underground, according to Dr. Alex Loyd in The Healing Code. And according to Dr. Bruce Lipton in The Biology of Belief, it’s these unconscious memories that are at the root of at least 98% of illnesses. It’s the environment of the cell that determines its health, and that environment is created by our beliefs, not our DNA. Beliefs may well be the “switches” that turn on or off the genes that supposedly cause our illnesses. It would be easy to dismiss such “balloon” memories. “Get over it, it’s just a stupid balloon,” the adult part of me says. But the 4 and 5-year-old child part of me still hurts over it. Jesus does not turn away these child parts of us. He welcomes them. We can take our balloon and Popsicle memories to him and ask him to heal them. We can ask him to speak the truth into our lives. His truth opens us to the kingdom, where he rules over that area of life. And when that happens we, and the little children parts of us, are healed and blessed. Diane Eble is a Certified Healing Codes Caoch/Practitioner and writer. This was adapted from Healing Heart Issues.